Challenging the Bonsai A to Z entry for Cedar - Japanese (Cryptomeria japonica). 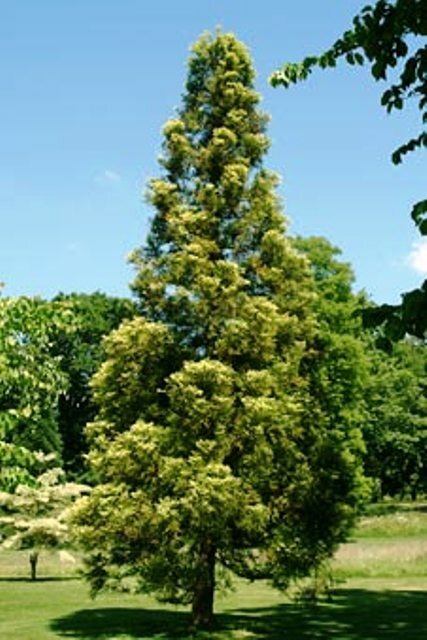 Very tall evergreen native to Japan distinguished by red-brown string bark and blue-green foliage which changes to a bronze/brown tint in winter. STYLE : Best in formal/informal uprights, groups and twin trunk. WARNING : Clean out old foliage, spray daily with cold water and monthly with insecticide to prevent red spider mite infestation which can cause die-back. Picture shown : "With the permission of the Trustees of the Royal Botanic Gardens, Kew"
LOCATION : Full sun position throughout the year. Needs protection from colds and frost. SOIL : Free draining soil : 40:60 grit:organic. pH 6.0-7.0. PINCH : Pinch back needles around new growth to 12mm (half inch) long. Do not cut needles. There are 819 entries in the A to Z and the pages have been viewed 3061136 times. Help us to increase the number of relevant bonsai terms included in this A to Z of Bonsai Terms. We include manufacturers and dealers in the dictionary, if you are one or know of one not mentioned then just click the link above and add an entry. If you have a favourite bonsai tree not mentioned just add an entry. We are trying to create a unique single free source for all bonsai terms and hope to capture worldwide bonsai terms for bonsai trees, bonsai clubs associations and national collections and the A to Z is free marketing for bonsai businesses and bonsai clubs.